The fight against unpaid internships has turned another corner at Concordia. Joining the Journalism department in the movement, student associations in Communications and the School of Community and Public Affairs have shown an interest in pressuring the university to change their policies surrounding internships at Concordia, with strike votes set to take place this month. The Coms Guild and the SCPA Student Association will be holding general assemblies next week on Feb. 20 and 21, respectively. Given that both the Journalism and Communication department share a building at the university’s Loyola campus, the Coms Guild’s Vice President of Academic Affairs Hannah Gold-Apel said she hopes to coincide their strike with journalism students. The Guild’s Vice President of Internal and External Affairs Nicholas Gertler said they will likely motion for a three day strike starting on March 6. Journalism students plan to strike during the first week of the Quebec-wide unlimited strike against unpaid internships, which will likely begin in early March. “It will be a lot more powerful if our entire building goes on strike at a coordinated time,” said Gold-Apel. SCPASA Academic Affairs and Advocacy Secretary Sean Illman-White said they are also looking to hold their strike for three days in March if the vote passes. 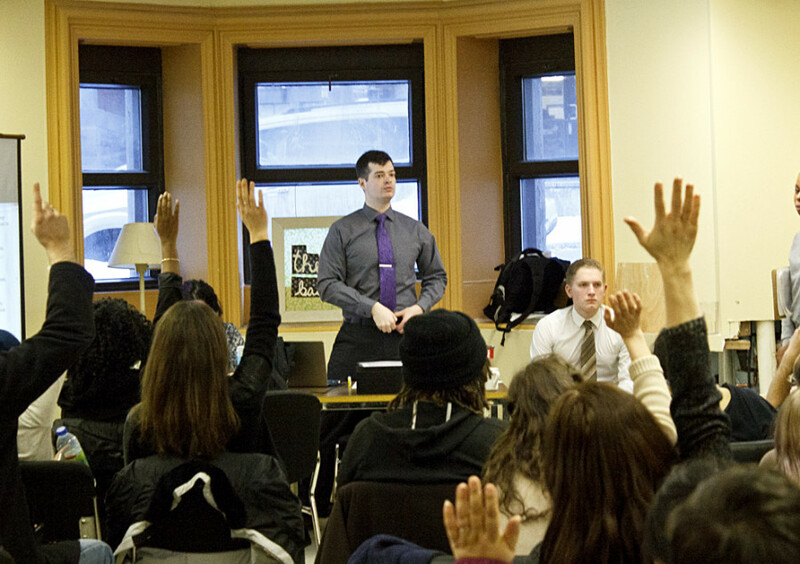 Both the Coms Guild and the SCPASA held meetings on Jan. 31 to discuss unpaid internships and see whether their students are in support of a strike in their own departments. “I would say, pretty conclusively, there is a strong strike support within the department,” said Gold-Apel. The catalyst for strike votes began after the Journalism department voted unanimously for a week-long strike on Jan. 16. A day later, the Arts and Science Federation of Associations voted to stand in solidarity with the Journalism Student Association and support other ASFA associations who may also choose to strike. “We want to make sure the department knows it’s coming from students and not just us,” said Gertler. At the SCPA, Illman-White said a mobilization committee is not in place yet, but he expects that one will form after their strike vote. While both the departments are in the early stages of the mobilization process, Gertler, Gold-Apel and Illman-White mentioned they’re not looking to organize a general unlimited strike.